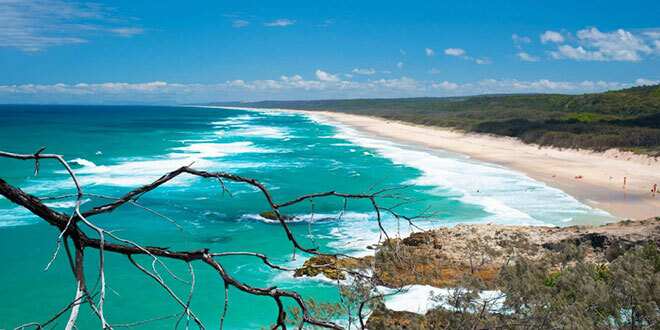 Island paradise: New South Wales governor Sir George Gipps allowed four priests to use an old convict building in Dunwich, on Stradbroke Island, home to the Quandamooka people, consisting of three tribes of Noonucal, Goenpul and Nughie. IT was the first attempt to evangelise the Aboriginal people of Queensland, and it failed. Archbishop John Bede Polding, the first Bishop of Australia, approached the Congregation of the Passion of Jesus Christ, better known as the Passionists, to preach the Gospel to the Aboriginal people of Queensland. Archbishop Polding believed the Catholic Church had for too long neglected the Aboriginal people, and with support from Pope Gregory XVI, organised the first Church-led outreach in Queensland. New South Wales governor Sir George Gipps allowed four priests to use an old convict building in Dunwich, on Stradbroke Island, home to the Quandamooka people, consisting of three tribes of Noonucal, Goenpul and Nughie. The priests were told to preach the Gospel, convince the Aboriginal people to settle and become “civilised” citizens, and start a Christian community. Archbishop Polding and one Swiss Passionist, Fr Joseph Snell, arrived on the island on May 18, 1843, quickly followed by Passionist priests Fr Raimondo Vaccari of Rome, Fr Luigi Pesciaroli of Canepina, and Maurizio Lencioni of Lucca. Three of the four priests spent around three years on the island trying to convert the Aboriginal people to Christianity by way of Catechesis. They even tried taking the children away from the parents – with the Aboriginal people’s consent – and sent them to Sydney to receive an education from a convent of nuns. By 1846, the priests had no success at all in converting any members of the Aboriginal tribes, so three of the priests left the mission. Fr Vaccari remained on the island, but eventually left in 1847. While Church historians claim the mission was an “absolute flop”, 175 years later, the Passionist’s landing on Stradbroke Island is, incredibly, still celebrated by the remaining Aboriginal people. Quandamooka elder Aunty Joan Hendriks says 175 years after the Passionist’s so-called “failed” mission, a small but caring community continues to baptise and preach to the Aboriginal people. In 1993, Aunty Joan Hendriks assisted in the organising of the Mass to celebrate the 150th anniversary of the first mission days, signalling what was deemed a failure was actually a success. A Mass for the 175th anniversary is also being held today at St Paul of the Cross Church, Dunwich. The Government Benevolent Asylum remained at Dunwich from 1865 to 1946. Fr Butler as the Catholic chaplain of the Asylum assisted families on Stradbroke Island in the preparation and baptisms of children. His departure led the community to become leaders in the church. Elder Ted Brown helped get the whole community involved, both businesses and local community groups alike. Aunty Bethel Murray’s leadership and ongoing commitment to the continuation of the children for their sacramental programs has also been recognised as central to holistic wellbeing of body, mind and spirit. She nurtured family members Aunty Bethel Delaney and sister Aunty Rose Borey to follow in her footsteps in continuing the legacy of belonging as community of St Paul of the Cross Church. 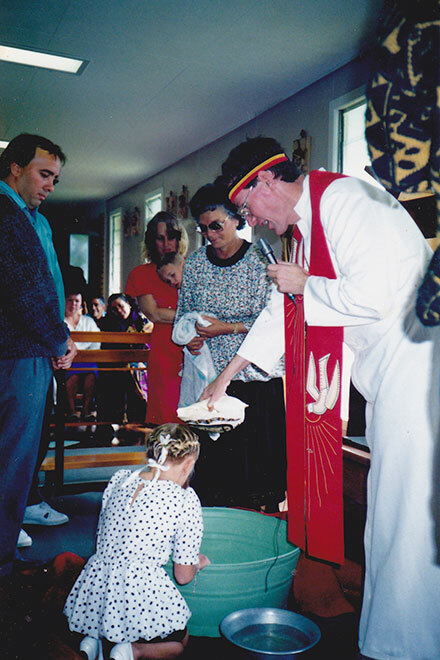 Island faith: In 1990, a Stradbroke Island Baptism with Fr Gerry Hefferan, Aunty Joan Hendriks, parents George and Carmel Karklis and daughter Tania. Aunty Rose has dedicated her life to ensuring the continuation of the church being a place of belonging for our community as a whole including the priests and religious are welcomed to our homelands. She has led our community in caring for and sharing the load as a committed group and is respected as our senior Church elder. Aunty Rose’s three daughters have followed their mother example. Lesley Crouch, the eldest daughter, was a committed extraordinary minister of the Eucharistic during her lifetime and her sisters Bernice Fischer and Margaret Grenfell continue as active members of church ministry. It is clearly identified that our small but caring church members are caring and sharing ministry leadership and other necessary roles as local Church Community. The preparation for the forthcoming 175th Anniversary on the May 27 exemplifies this. In 1993, the island witnessed the celebration of the 150th anniversary of the first mission days; hundreds of visitors came to the Mass, which saw 20 plus baptisms on the day. Twenty-one Passionist priests travelled to the Island to concelebrate on this special occasion. Bishop John Gerry, Fr John O’Halloran, Deacon Monty Pryor, and Fr Gerry Hefferan were the celebrants. Provincial Kevin Dance delivered the message of the day and there were 20 baptisms as part of the Mass. In his welcome and opening address, Bishop Gerry referred to the ongoing focus of the failure of the Passionist Mission in the 1840s; and related that it “seemed a strange statement, when 150 years later leaders of the Brisbane community included two women from Stradbroke Island who were leaders within the Archdiocese of Brisbane”. There is also the fact that over the past 50 years, our women have been representative on many church committees from local State, National and International committees and Gatherings. In 1990, the sorrowful pain of 13 deaths in six months led to the first Good Friday morning Memorial Service with Fr Hefferan officiating in the historical Dunwich Cemetery. Over the past 28 years this Annual Memorial Service has continued. It has not interfered with attendance at the Stations of the Cross, which still remains high as per usual. In September 1990 Fr Hefferan celebrated Mass and conferred six baptisms for one senior elder; two Adults and three children. There have been ongoing baptisms at intervals along the way. 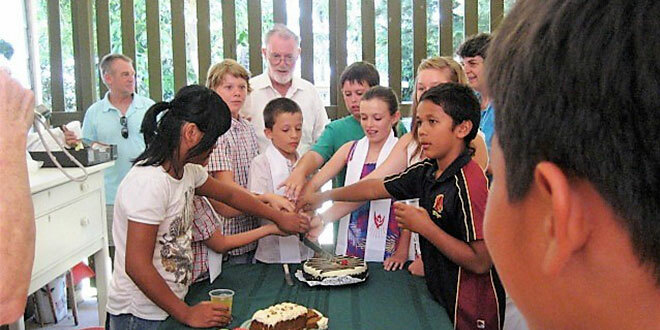 Blessed day: A 2010 Confirmation of Stradbroke Island children. We are small in numbers but our journey continues to maintain the focus of where two or three gather together as my followers I am there among them (Matthew 18:20). We gather as community every first and third Sunday to celebrate Mass with our parish priest Fr Ashley Warbrooke. The weeks in between we still gather with our Church leaders who are responsible for leading a Liturgy on the weeks in between when our parish priest is not available. We give thanks for all the religious orders who have assisted in keeping the faith alive in our Stradbroke Island community. The commemoration Mass for the 175th anniversary since the Passionist’s arrived on Stradbroke Island will be held on Sunday, May 27 at 9am at St Paul of the Cross Church, Dunwich.